I received an Erin Condren Notebook to review for this post. Additionally, the links provided are referral links. You will receive a $10 off code for signing up for their newsletter as will I. This is not the first time I have talked about Erin Condren on this blog. Her products and site is my go-to place for all calendars, organization and stationary. More than anything, I love all the colorful designs and the ability to personalize everything! I’m big into personalization. 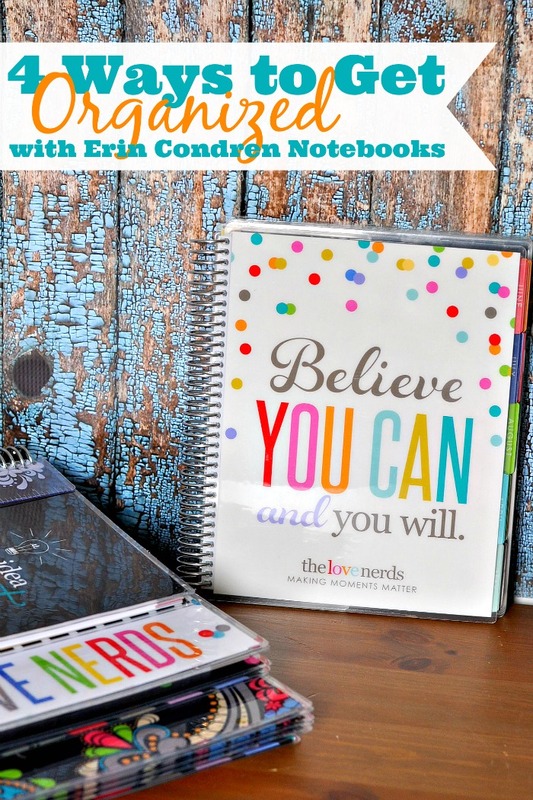 So when Erin Condren’s team reached out to see if I would review their new notebooks, I, of course, said yes! I have already been using their notebooks for both blog brainstorming and for research notes, so this was a fun way to try out the new versions and I love them! I wanted to give you ideas on how you can use these notebooks in your life. 1. Editorial Calendar and Brainstorming: One of the new options for the notebooks is to add a calendar at the beginning. 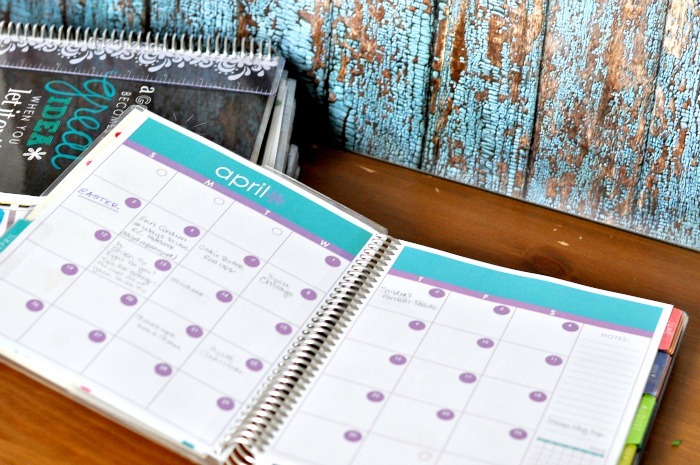 You can choose which month it starts on which I think is awesome – Mine started this month since I want to start using it right away for planning but you could also start it in August for a new school year. So many options! I had been using an old notebook for planning, but I am completely switching over to this one. If you are not a blogger, this works so well as a project planner for any big projects. You can write notes for every month of what needs to be accomplished and set goals right there as a constant reminder. Then, use the notebook pages to write chapters of a book or create to-do lists or write down ideas as soon as they come to you. I love having a place for everything! As a blogger, I ordered dividers for every category of my blog (recipes, DIY home, etc) so I can brainstorm by category. 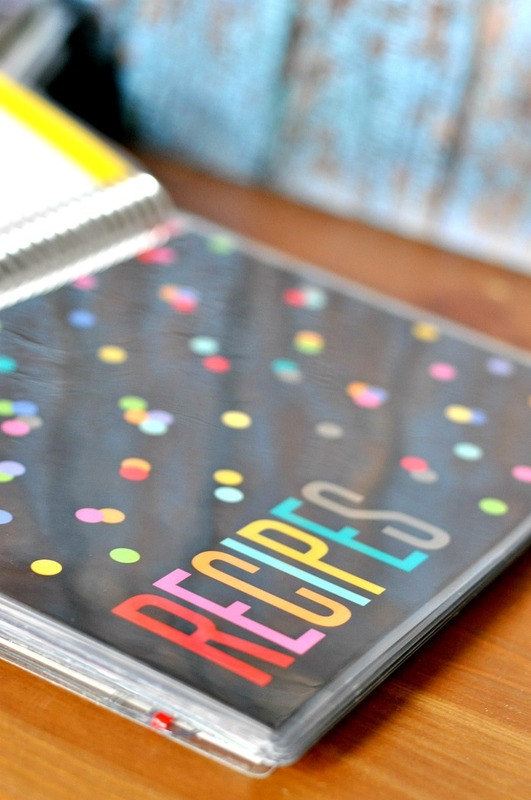 This means that when I go to fill out my editorial calendar, I can flip back in the same notebook to see what ideas I have for recipes and fill in the spots accordingly. I LOVE being organized and having one place for everything. 2. School Notebook: I would be remiss if I did not mention how great this works as a school notebook. It is personalized (less likely to lose it and never get it back) and you can create dividers for every subject. Plus, those dividers work as dry erase boards so students can track big due dates or important formulas, for example. If you buy the new DELUXE Erin Condren Notebook, it will also come with a zip lock pound for pens and pencils and a pocket folder in the back for keeping track of lose sheets of paper. The coil clip in accessories is also great for loose paper like a syllabus – you can add it right to that class’ section. 3. Family Journal: I am going to be sharing about this later, but my husband and I bought a notebook to use as an Anniversary Journal every year. We will be keeping track of where we traveled that year, the big events that happened and things we don’t want to forget. Life moves so fast and we wanted a place to keep everything for the future. 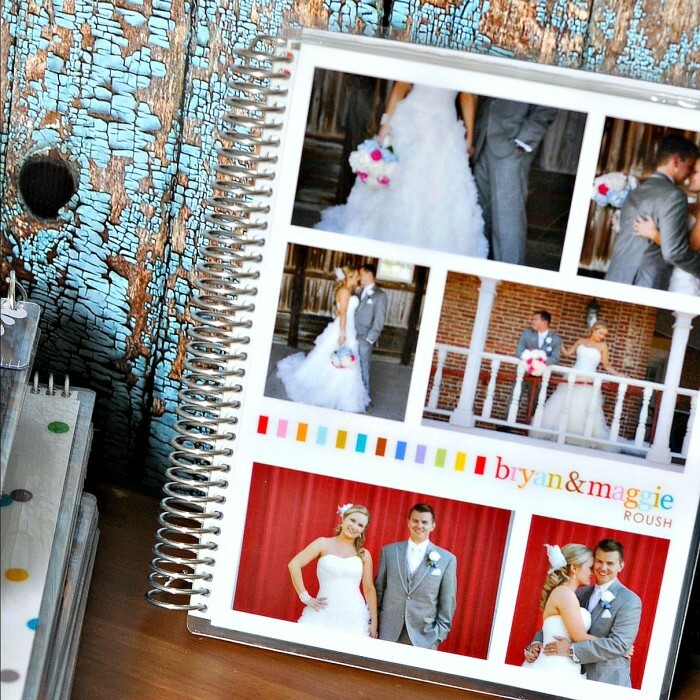 On their site, Erin Condren shows a video example of a family journal with a divider for every member of the family. I love this idea and will definitely be using it when we have kids. Or, maybe I will have a notebook for every kid. Wouldn’t it be fun to have a place to write them notes and keep track of their big accomplishments to then give them one day?! 4. Personal Journal and Writing: I am toying with lots of ideas in my head for e-books, but I am a pen and paper person. I can struggle with getting ideas down on the computer, so I ordered myself the new KEEP IT SIMPLE Erin Condren Notebook and chose their “Ready to Ship” option because I LOVED the cover and didn’t feel like I didn’t personalization for this one. 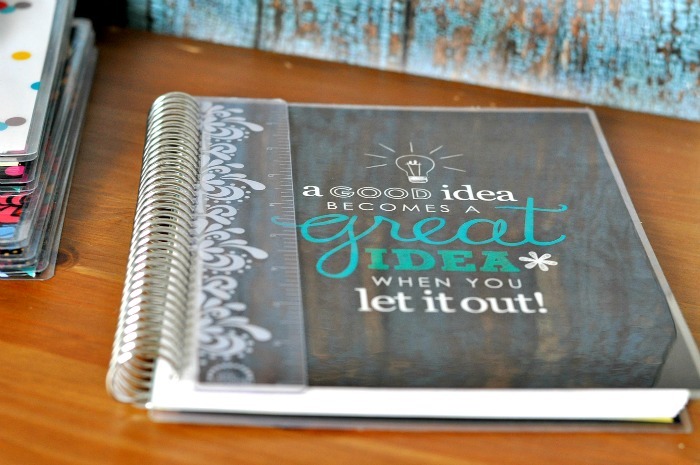 The quote says, “A good idea becomes a great idea when you let it out!” I love all these motivational reminders. I really chose to do this in a notebook to stay organized. The last thing I need is to write down ideas or thoughts on random pieces of paper everywhere. I like things contained and neat. If using as a writing notebook in the future for a definite e-book, I could see the benefit of the calendar to set goals and publication dates. For right now, this is the perfect place to get ideas out and see what happens. Maybe a GREAT IDEA will happen. Now – Let’s get into more of the nitty gritty details of the Erin Condren Notebooks. They come in both 7×9 and 8×11. You can order interchangeable covers with the ability to add a photo. Notebook lays flat when opened. Includes 133 college ruled lined pages (66 sheets) with 21 designer blank pages (10 sheets). Comes with clear, snap-in bookmark. The DELUXE Notebook also comes with: 2 sheets of blank stickers, double-sided folder, bound-in zip lock pouch, 12 gift labels/stickers and the option to add the coiled-in monthly calendar. 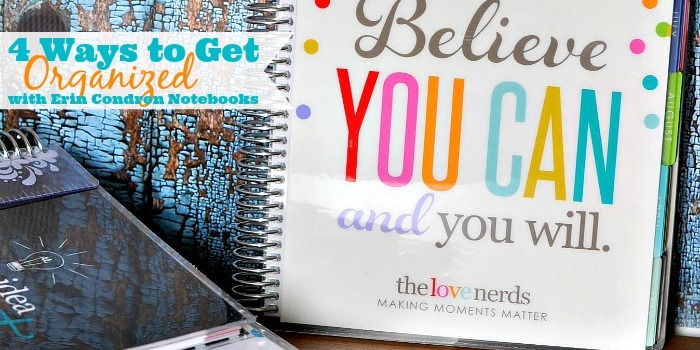 Now it’s time for you to go check out Erin Condren and these notebooks yourself AND their fabulous other products. Plus, with the new life planners coming out soon, they are currently on sale for 40% off! Isn’t that exciting?! Remember, my referral link has been included in this post. Sign up for their newsletter and you will receive a code for $10 off your order.